Pelican™ 1560 Case with Padded Dividers (Desert Tan) on Sale Today! 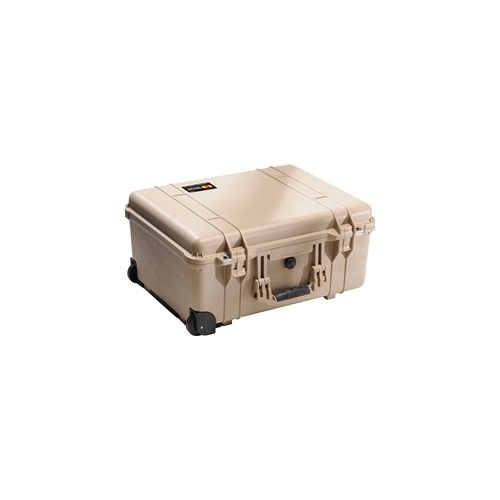 The Pelican™ 1560 case with Padded Dividers (Desert Tan) boasts more than 2,800 cubic inches of storage space. Complete with side handle, front handle and convenient extension handle, it will be the perfect rolling travel companion. An added value to this case is the effortless release latch for the 17" retracting extension handle. Also, the metal reinforced padlock protectors provide added strength and extra security against cutting and theft. The Pelican™ 1560 with Padded Dividers (Desert Tan) is a durable, watertight, airtight, dust-proof, chemical-resistant and corrosion-proof hard case used to carry any kind of equipment that needs to be protected from the elements. Just like all Pelican™ Cases the 1560 case is made of ultra-high impact structural copolymer that makes it extremely strong and durable. It has a 0.25" (6.4 mm) neoprene o-ring, two easy-open double throw latches that seal perfectly. It has a built-in, automatic pressure equalization valve for changes in altitude or temperature. The case uses stainless steel hardware and has padlock protectors to provide added strength and extra security against cutting and theft. It is carried by a comfortable rubber over-molded top and side handles, retractable pull extension handle and built-in wheels. The Pelican™ 1560 case with Padded Dividers (Desert Tan) is another popular case in the medium size case category. Just bigger than the popular 1510 carry on case the 1560 case gives you a little extra room for more stuff. It's a perfect mid size case between the the smaller mid size cases and the large cases. Easy to manage with same great protection. The 1560 case with Padded Dividers (Desert Tan) comes with the standard case features like the water and dustproof neoprene o-ring seal, Automatic Purge Valve with Gore-Tex membrane, and easy open Double Throw latches. Lifetime Guaranteed. You break it, we replace it forever.